Pellet Grills may have been invented not too long ago, in the year 1985, by the iconic Joe Traeger, but in that short span of time, it has become a beloved cooking appliance for people the world over. Backyard chefs especially, can’t seem to get enough of what a great job this appliance manages to do. A good pellet grill has the ability to grill, smoke as well as roast, so if you are someone who loves hosting barbeques then you need to invest in a pellet grill at the earliest. Investing in a Pellet Grill is indeed a good idea, but prior to purchasing one, you should make sure that you think about the exact features you would like your grill to have. The market is truly filled with various companies which make tall claims! Though some companies deliver on the promises which they make, other companies fail to satisfy the customers in any way, whether through their products or even their customer services. Camp Chef is one such reliable company which was founded in the year 1990 and in the last twenty seven years this company has managed to carve a considerable niche for itself in the world of outdoor cooking. Camp Chef is famous for the variety of pellet grills which it sells, irrespective of your budget or requirements; you are bound to find something which fits your bill exactly. The Camp Chef SmokePro DLX Pellet Grill, is the obvious pick for most people who are looking to invest in a pellet grill owing to the fact that it has great features and comes at an incredibly affordable price. 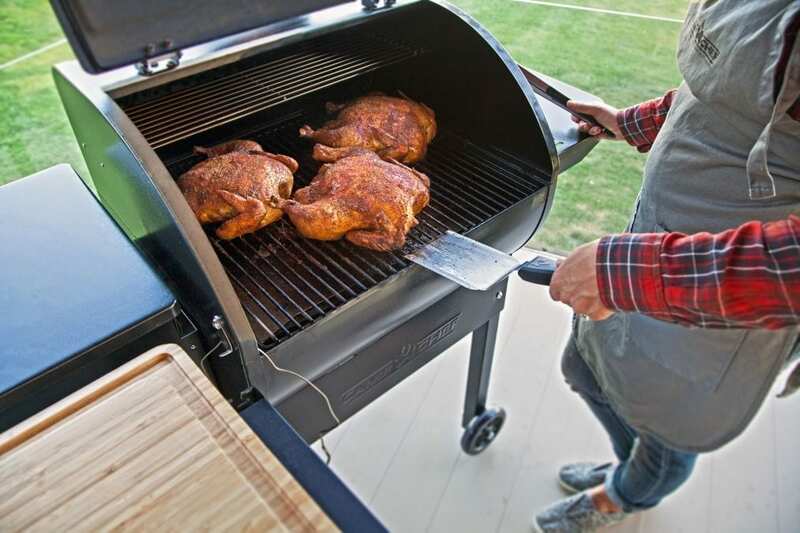 With its huge hopper capacity and grilling surface, this grill, with a surface of roughly 570 square inches, is great for those families who are quite large. Apart from this other great features include a helpful digital readout, additional smoking rack, pellet capacity and even the fact that it moves on wheels. The only con of the product, is that there is a lot of ash accumulation in the smoker, yet given the other pros of the product this is something which can certainly be skimmed over. The Camp Chef PG24 Deluxe Pellet Grill is also rather easy on the pocket and gives an enhanced and authentic Smokey flavor to the food being cooked on it. What sets the grill apart is the fact that it comes with extremely impressive digital control systems. Though these are extremely advanced settings, yet they can be easily understood by any users. If you invest in the Camp Chef SmokePro DLX PG24 Pellet Grill , you will be getting a pellet grill which allows you to do an array of things whether- smoke, roast, grill, braise, or simply barbeque any foot you want! When it comes to this pellet grill, you can rest assured that temperature control will certainly not be a hassle at all. With a temperature range of 160 to 500 degree, this grill allows you to have complete control of the way you decide to cook your food! So whether you would like to lower or higher the temperature of the grill, this can simply be done by a click of a button. The only minor con or rather inconvenience of this grill is that the ash incessantly gets stuck at the bottom and that the warming rack is often a hindrance, but these two things are hardly reasons not to invest in this exceptional grill. The Camp Chef Woodwind Pellet Grill with Sear Box is much like the Camp Chef PG24 Deluxe Pellet Grill which has been discussed above but the chief difference is that temperature control is slightly easier with this machine. Price-wise, this pellet grill is exceptionally affordable as it comes within the ‘below 1000 dollars’ bracket. But what makes this grill so amazing is the fact that it comes with a searing box and that it has its Camp Chef-patented ash cleanout. The versatility, great craftsmanship and exceptional features of this grill makes it easy to ignore the only con of this pellet grill, which is the fact that the ash tray cleanout has trouble functioning in the cold. In addition to being sold with the Camp Chef Woodwind Pellet Grill, this sear box is also sold separately on sites like Amazon at the pocket friendly price of just 199.99 dollars. With its stainless steel body and in built ignition, this box is certainly a very smart investment!